12 and 13 May last week, saw the opening of two mosques, in Nottingham and Walsall. Both mosques were graced with the attendance of Hazrat Khalifatul Masih Vaa. Local Ahmadis as well as Ahmadis from other parts of the UK travelled to these areas and joined the crowds of hundreds who were there to witness this historic occasion. A reception was held at Walsall following the aforementioned events. Such receptions have now become a tradition of Jamaat-e-Ahmadiyya. 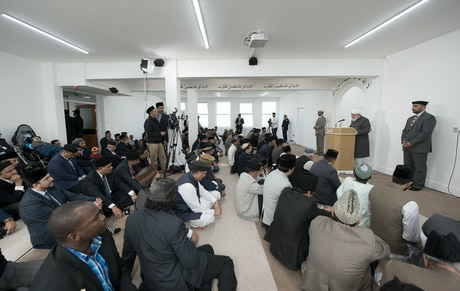 Local community members, neighbours and members of the local authorities are invited to attend such mosque-opening receptions with the purpose that they are able to know that the mosque being built in their area is an Ahmadiyya Muslim mosque and will be a means of spreading peace and harmony in society and – contrary to the general impression of a mosque these days – not propagate terror or violence. The purpose has been well met all along, ever since the initiative has been introduced by Hazrat Khalifatul Masih Vaa. Under Huzoor’s leadership, hundreds of mosques have been built across the globe. This might sound easy but the challenges usually faced by the local Jamaats in only attaining a plot of land is something that most of us cannot imagine. The local authorities in Western countries have always shown concern over mosques being built as it can lead to an uproar in local communities, who – unfortunately – have come to know a mosque as a place where hate is preached. Once these steps are overcome, then come the stages of planning permissions, funds, drawings and construction; every stage bringing with it an array of challenges. Such receptions play an immense role in introducing the local public to Ahmadiyya Islam (or the true Islam), which enables them to see a very different side of the picture. The aspect that changes their minds (and hearts) is the way Hazrat Khalifatul Masih Vaa speaks to them and describes to them the Ahmadiyya mosque-building schemes. The Jamaat has a whole philosophy behind this scheme, which Huzooraa summarises for them in his address; the philosophy of winnings hearts and not lands. These addresses by Huzooraa to guests at the receptions work as a preamble for a long-term relationship between the local community and the local Jamaat that endures forever. 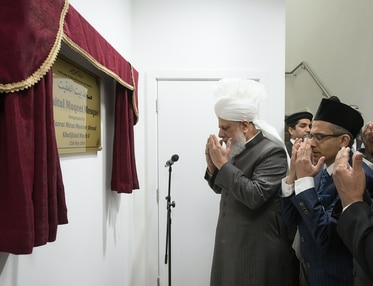 The Fazl Mosque was the first mosque to be built in London (in 1924) and has now entered the fifth-generation of cordial relations with the local community. Every Ahmadi mosque inherits this tradition and the credit goes to the inaugural addresses of Huzooraa and the continued guidance he imparts for the local Jamaats at every stage of decision-making. Congratulations to the Walsall and Nottingham Jamaat, on behalf of Al Hakam and the global readership, that they have now been blessed with mosques. 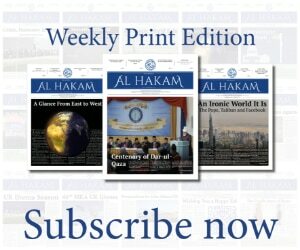 This, God willing, will further open new avenues of tabligh in the local regions.